The ability for employees to raise Purchase Orders directly within a system is a big plus for companies with a large asset turnaround. It helps avoid a deluge of request emails being sent to the Supply Manager, overwhelming them in the process with multiple unsorted requests. For those companies who do rely on email when dealing with POs, it leaves the Supply Manager with a bloated inbox and a need to manually create outgoing requests to suppliers. Being able to do all of this within a dedicated system saves time, limits errors, and is entirely traceable and accountable. ApprovalMax allows employees to create Purchase Orders in a fully controllable environment. It not only facilitates the approval and routing of requests, but also ensures employees are provided with precisely the level of access required to create POs. This is particularly useful as it restricts access to sensitive accounting information to only those who need to see it. So, let’s take a quick look at the restriction possibilities provided by ApprovalMax, and how these can be utilised to create a more efficient workflow. Requesters can be restricted with regards to the data they can see and use when creating Purchase Orders. 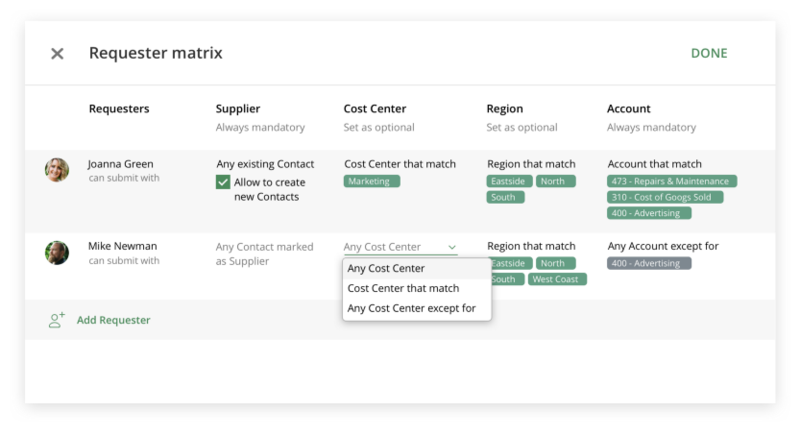 For example, access rights can be configured so that a Requester is only allowed to select from particular Suppliers or a specific cost center (set as the Tracking Category in Xero) when creating a PO. Other restriction criteria include: Account (GL code), Item, Tax, and Branding. Setting such restrictions can support various purchasing scenarios. For example, when a company or department has junior employees, it makes sense to restrict the number and type of suppliers to which they have access – for instance, nurses in hospitals purchasing medical supplies from an approved supplier list. What’s more, configuring access offers a level of accountability and security. Instead of being able to request delivery of goods to any address (as is the case in Xero), employees can be restricted to ordering to the company address only. Note: If you’d like to see a full list of restrictions for Requesters, or to request an additional restriction feature, please contact support@approvalmax.com. First, click on the “Matrix” icon in the first step of the workflow to open the “Requester Matrix”. Next, add Requesters who will be allowed to create Purchase Orders. And finally, specify the restriction criteria, such as: Supplier, Account (GL code), Tracking codes, Item, Tax, Branding, etc. Being able to exert a granular level of control over employees when it comes to Purchase Order creation can save headaches, delays, and costly errors. ApprovalMax can give you this control, and save you from a bloated email inbox.